I used to teach science in junior high school. I took my students outside as often as I could. Learning life science only from a classroom desk never seemed too valuable. Trees and other common plants are easy studies to work on. Summer is a great time to get involved. The leaves are out, and flowers abound. Upload your photo from your computer or the smartphone using the app for iPhone or Android phone. 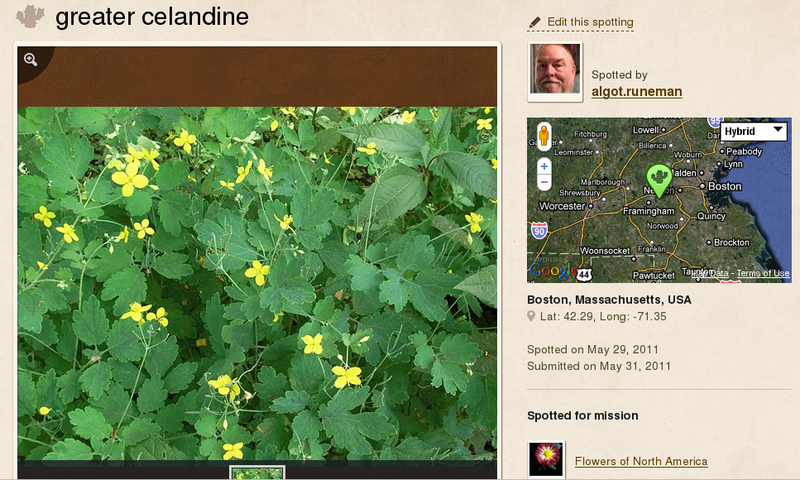 You can contribute photos of living things you have identified. You can also submit the photos, requesting help getting them identified. Participants range from interested amateurs to seasoned professionals. Each photo helps to document plant diversity. Because you are asked to report the date and location, your photos help describe the geographic spread of even the most common organisms. You might even find something that has not been observed before. Among the project “missions” that Project Noah has established are North American Flowers, European Flowers, and Urban Biodiversity. Grab your camera. Get out there into the natural world which surrounds us. Get away from that computer, TV, classroom desk, whatever. Project Noah doesn’t take ownership away from you, but your sharing with others is built into the purpose of the project. There is no cost to participate. I recently came across a simple cartooning idea. Basic characters in a simple comic format. Just add the dialog and…there it is, a cartoon. Thanks to Leo Loikkanen at All Filler, no Killer for the idea and inspiration. He created and released a cartoon template called “American Efficiency” using the CC0 “Creative Commons Zero” license. That makes the template essentially public domain. Anybody can use the template. Just download it to your computer. Print a copy and add your own dialog to make your own cartoon. Click on the image to see the full-size original. I’ve been exploring graphic ideas using Inkscape, a free open-source program for drawing vector graphics. I am NOT very artistic, and find that my limited talents are harnessed better by using a vector graphics tool than a freehand sketch/paint program like Krita (both on a GNU/Linux computer). I decided to try out the idea from Leo Loikkanen in Inkscape. Along with a basic template, I created a series of mood-showing characters, one male “Bob” and the other female “Betty.” Here’s my first effort. To make the process of creating a variety of cartoons a bit easier, I put together a page with a few mood images for each character. I’m releasing it as CC-Zero as Leo did his. Perhaps you could use it with students in your school or with your own children. Inkscape is a great tool for all sorts of things. 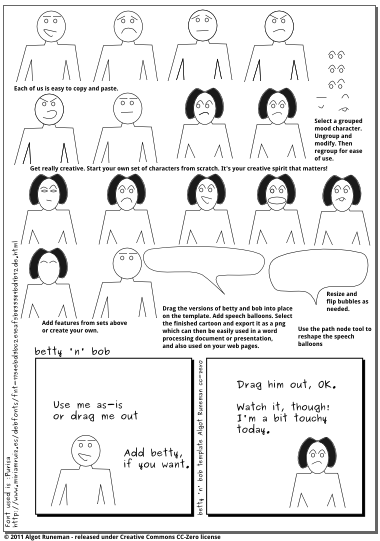 Inkscape Template 2x of betty ‘n’ bob. Use a right-click and “Save link as…” for all templates. Otherwise the template, an SVG file, may just display on your browser. In spite of the lack of popular demand, I’ve reworked the design template to be a three-panel design in two formats. One is just like the two panel, just on a rotated page. [Inkscape 3x Template] The other is an expanded template with a first-cut set of cartoon development instructions built into the template. [Inkscape 3x Instructions] Feedback is requested. Here’s your challenge for some time before September and the next school year. It is almost June and another class of seniors has shut off their push to finals and are coasting to graduation. Decide whether this is a game changer or not. Will a $25 computer change the learning process? Do you care about the issue of programming, or are you strongly in the camp of “computer as a tool”? What is your position on the importance of unplanned, extracurricular learning? I can’t help thinking of the “computer as a tool” is the tool of the status quo and the one to many power structure of the normal classroom. Such classrooms deliver content. IT departments decide what software is “safe” and what software they will support. Can we break out of this mold? Are we doomed to strip computers of their real power, the power to transform learning, providing individual options to each eager mind? Isn’t the whole Project Based Learning concept built around breaking the lock-step deliver-and-return process of lecture followed by quiz? Add one of these $25 computers to a lanyard around a student’s neck and give them a smartphone without a monthly thirty dollar gouge from AT&T or Verizon. What more will a student need to keep connected and creative? Switching to GNU/Linux was my best Windows system update. I use GNU/Linux most of the time. I keep a Windows partition into which I boot when somebody has a Windows question that needs a demonstrated answer. I don’t hate Windows. I just don’t rely on it for daily work any more. This week at my local FOSS user group, one of those Windows questions came up right at the end of the session and I didn’t realize the building was about to close down. After my quick demo, though, we had to get out so the staff could close the building down. I wasn’t bugged by that. The staff at the community center have supper to cook at home, after all. I was bothered, though, by the big pain of Windows updates. When I shut down my laptop using the approved menu steps, I got the very clear message. Do not shut down or power off your computer. You have 23 updates.There had been no warning before I committed to the shut down. The shutdown couldn’t be deferred once I saw the message. There was no way to put the updates on hold. I was a hostage to the process. I didn’t quite panic. I couldn’t stop to plug the laptop in. Fortunately it was almost fully charged. I went out the door and off to the car with hope in my heart that this wasn’t one of those major update-upgrades that would go on for an hour or more. I decided to carry the open laptop to my car. It had just started raining, so I tipped the laptop to get the rain to hit mainly on the screen’s back and not into the openings of the case. I rushed across the empty parking lot and used a napkin to wipe off the splattered raindrops on the computer once I was inside. On my way home, the updates finished and the laptop shut down on its own. No harm done. Windows! I was totally at the mercy of default update options of the operating system. The message was clear. The OS is in charge, not YOU! My GNU/Linux software updates work differently. I get a message in my system taskbar telling me I have updates available. I can check to see what they are. I can click a button to apply the updates when I’m ready. I can also ignore the notification and go on with my work or even TURN OFF MY COMPUTER when I want. I can put off the updates to a convenient time. I know. I know. I have the ability to modify the settings of the Windows installation so that I can better control the update process. But Windows programmers set the defaults and I accept defaults because generally the developers know what’s best. Ahem! For a desktop computer, automatic updates taking over my computer at shutdown isn’t so bad. I can turn off the monitor, the room lights and go home. The computer will whir along through as many updates as are needed. Then it will simply shut down, even if it is an hour after I’ve left the building. For a user on the go with a laptop, the automatic updates process is a headache. It is wonderful that the Windows headaches are now rare events for me. I’m going off now to change my Windows update settings. See you later. Chris Dawson writes about education for ZDNet. In a post today, he boldly recommends educators look closely at Canonical’s newest version of Ubuntu. There’s been a move by the Ubuntu distribution team to create a unified interface which works on desktops, laptops, and netbooks. What’s your take? Have you tried Ubuntu 11.04 with Unity? Happy Cinco de Mayo to you who are from south of the border.